The CSO has recently published Gross Domestic Product (GDP) figures for Irish regions (NUTS3) for 2014. This publication updates the preliminary figures for 2014 which were published last year (and also makes some changes to the 2013 figures) but it does not, unfortunately, provide any 2015 estimates. While a regional GDP figure is provided (Table 9a) most of the information for regional accounts is for GVA at basic prices (Table 9c). These are considered in this post which examines differences among regions and changes over time. Discussions of GDP inevitably must also consider on the limitations of the statistic as a measure of economic development (see here ) but it is the key statistic used, despite shortcomings. As Eurostat notes here GDP per capita does not provide an indication as to the distribution of wealth between different population groups in the same region, nor does it measure the income ultimately available to private households in a region, as commuter flows may result in employees contributing to the GDP of one region (where they work), and to household income in another region (where they live). This drawback is particularly relevant when there are significant net commuter flows into or out of a region. Areas that are characterised by a considerable number of inflowing commuters often display regional GDP per capita that is extremely high (when compared with surrounding regions). This pattern is seen in many metropolitan regions of the EU, but principally in capital cities and is very clearly displayed in Ireland in particular between Dublin and the Mid East. Indeed, the Solas Regional Labour Market Bulletin for 2016 has noted that the prevalence of inter-regional commuting was the highest in the Mid -East region, where 40% of workers who resided in the region were employed in other regions, the majority of whom were employed in Dublin. For this reason in most of the rest of the post Dublin and the Mid East regions are considered together. It highlights that commuting to work was also sizeable in the Midland region, where a quarter of those in employment were commuting to other regions , while in the Border, South-East and West regions the corresponding figure was about one-in-ten. Given these difficulties with the data, a better picture of regional growth and development would be gained from a broader focus considering Income, Wealth and Consumption data but while Income figures are available at NUTS 3 level (see here) there is little regional data on Wealth and Consumption. Despite issues with GDP and GVA they are important regional statistics and considering relative levels and changes over time can help us better understand economic development and growth in our regions. How much of our GDP is produced in each Region? The Dublin region contributed 45% of Ireland’s GDP and the South West contributed 17%. In contrast the Midland region produced 3% (see Figure 1 below) and the rest of the regions were responsible for between 5 and 8% of national GDP in 2014. The high level of commuting into the Dublin Region means much of that region’s GDP, more than any other, is produced by workers residing in other regions (mainly the Mid East but also Midland and Border regions). It should also be remembered that the regions also vary considerably in size. While Figure 1 shows the GDP produced in each region in 2014, Figure 2 shows the proportion of the population (as estimated by the CSO for 2014) in each region. Some of the reasons for the different distribution of population and economic activity are discussed later in this post. 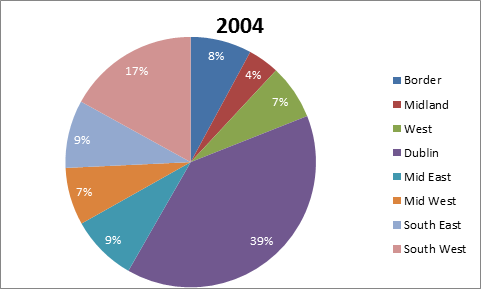 It is interesting to see how the proportion of GDP produced in each region in 2014 compares with that in 2004 (Figure 3). In that year Dublin produced 39% of GDP (compared to 45% in 2014) and the Border produced 8% compared to 5%. 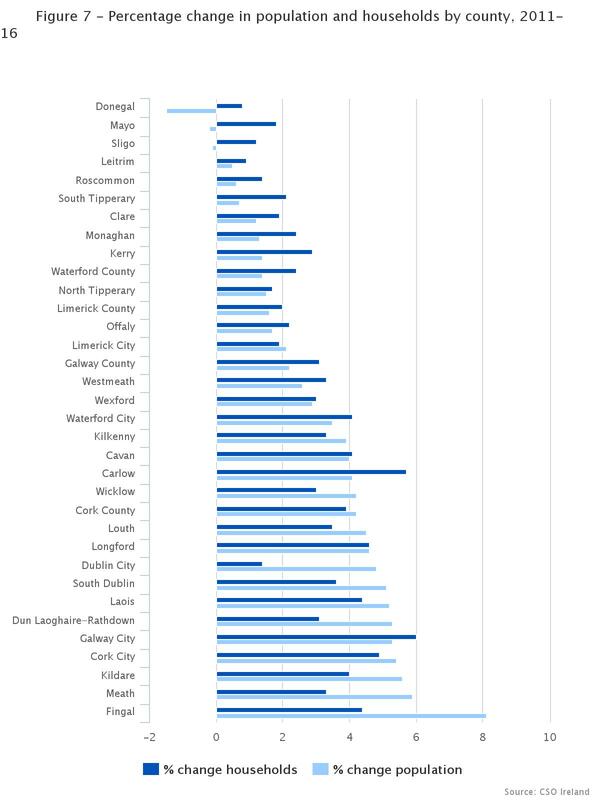 This, as will be seen again later in this post, shows the dominance of Dublin, in particular, but the South West is also increasing its relative contribution while the relative importance of GDP from other regions has reduced over time. Clearly Dublin produces much of Ireland’s economic output, but it is important to look at how much is produced per person in each region. As noted by Eurostat here, in a majority of the multi-regional EU Member States, capital city regions were generally those with the highest average GDP per capita; the only exceptions to this rule were Germany, Italy and the Netherlands. 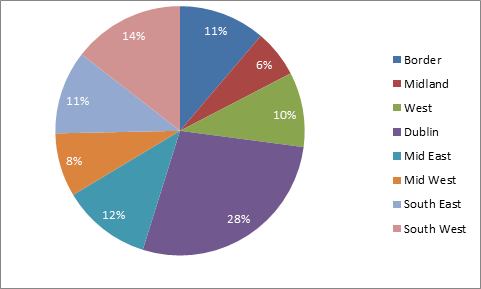 Figure 4 shows the amount of GVA produced per person resident in each of the NUTS3 regions. 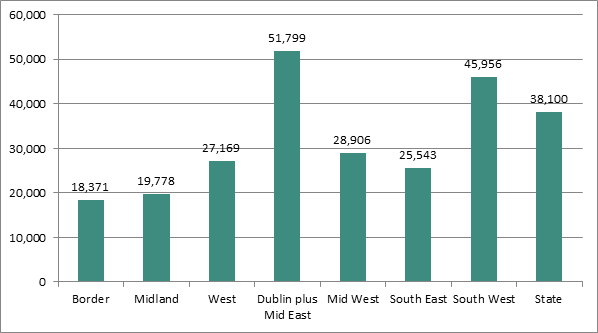 Dublin and the Mid East had the highest GVA per person in 2014 (€51,799), while the South West also had high output (€45,956). 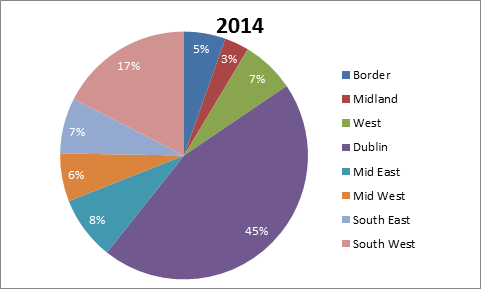 In contrast the Border (€18,371) and Midland (€19,778) were much lower, the Border region only 35% of that in Dublin and the Mid East and the Midlands 38%. Regional recovery in GVA- or not…? The different trends in GDP overtime can be seen in Figure 5 below which shows GDP per capita for 2006, 2010 and 2014. The Border is the only region to still have a lower GVA per person in 2014 than it did in 2010. 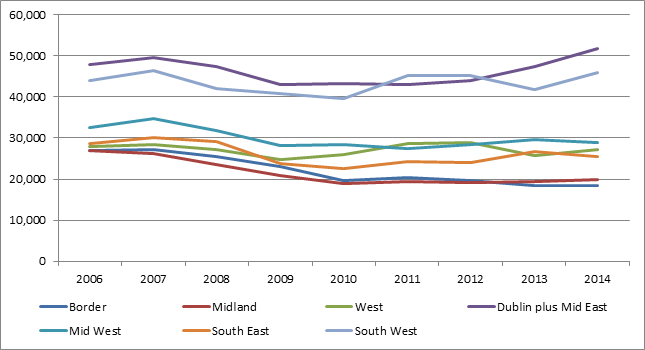 All other regions are now above the 2010 level, (though only by small amounts in the Midland and West). 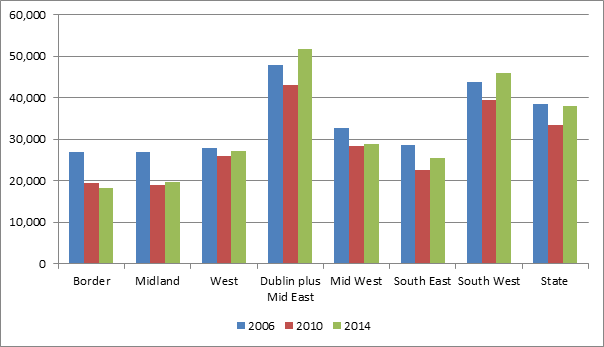 However, only Dublin plus Mid East and the South West had higher GVA per person in 2014 than in 2006. Looking at the variation since 2006 (Figure 6 below) the strong recovery in Dublin and the Mid East since 2011 is evident. The recovery in the South West was less consistent with a decline in 2013 but these two regions are significantly ahead of the other regions both in terms of the level of GVA per capita and the scale of recovery. The West region which had begun to recover well had GVA growth between 2009 and 2012, it fell in 2013 but 2014 shows some recovery while recovery in the Midland and Border regions has been sluggish. Figure 6: GVA per person 2006-2014 (Basic Prices) NUTS3 Regions. These differing patterns of change can also be seen clearly when GVA per person is shown as an Index where the State =100 (Figure 7). This allows us to consider the GVA per person in each region compares with that in the state over time (2006 to 2014). 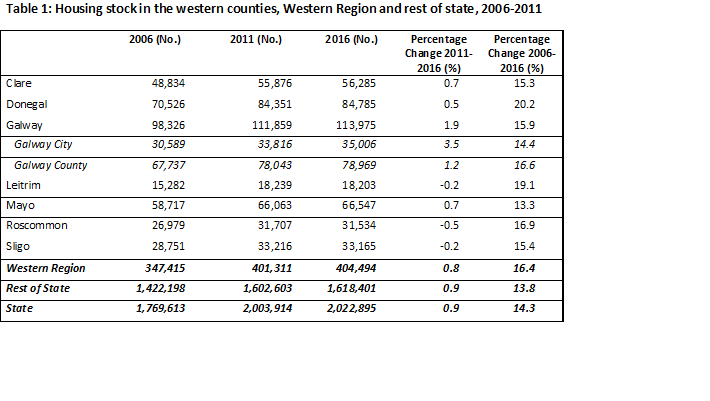 The relative decline (compared to the State) in 2014 for all regions except the South West and Dublin plus the Mid East is worrying and the widening of disparities among the regions since 2006 is very clear. In 2006 the gap between the lowest GVA per person (Midland 70.0 points) and the highest (Dublin plus Mid East 124.7 points) was 54.7 index points, but by 2014 the gap had increased very significantly to 87.8 index points (Border 48.2, Dublin plus Mid East 136.0). In 2014 the Border (48.2) and Midland (51.9) were very low compared to the state, but even the South East (67.0), West (71.3) and the Mid West (75.9) have low GVA per person compared to the state average. How do Irish Regions compare to the EU average? 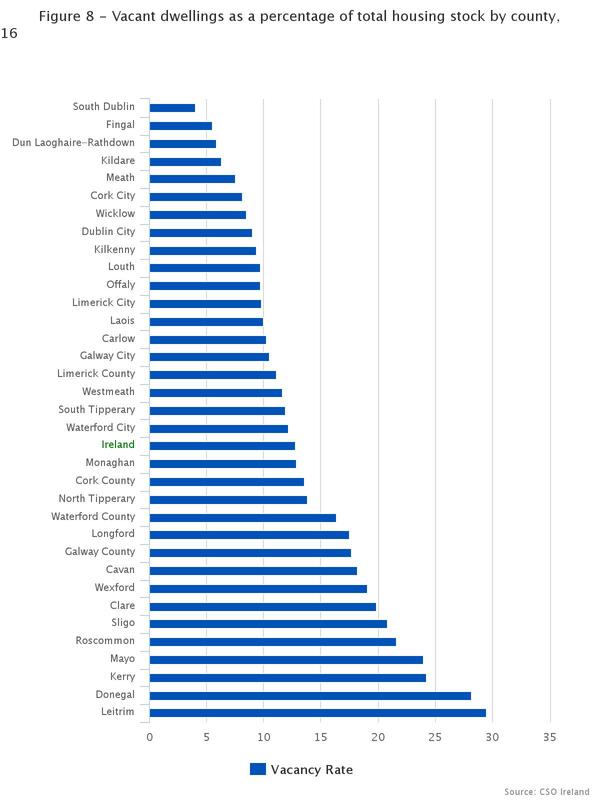 It is useful to look at how Irish regions (at NUTS 3 level) compare to the EU average. This is shown in Figure 8 with Indices of Irish regions between 2006 and 2014 with the EU average equalling 100 in each of those years. The disparities discussed above are also clear relative to the EU average GVA per person. In 2014 two of the regions (Dublin plus Mid East (179.5) and South West(159.2)) were significantly above the EU average while the Mid West, which was consistently above the EU average from 2006 to 2013 was just barely above for 2014 (100.1). The State itself was also above the EU average (132.0). In contrast, the West, which was briefly above EU average in 2012 and 2013 has again fallen below the EU average (94.1), while the South East was 88.5 in 2014. The other NUTS 3 regions (Midland (68.5) and Border (63.6)) were both considerably below the EU average and both less than 75% of the EU 28 average. Most EU structural funds are directed to NUTS 2 level regions where GDP per capita is less than 75% of the EU28 average. While both the Midlands and Border regions are well below this, when combined with the West the NUTS2 Border, Midland and West (BMW) region was just above the cut off for structural funds at 75.7% of the EU average in 2014. By comparison, in 2006 the BMW region was 106.1% of the EU28 average. Within regional accounts, labour productivity is defined as GVA at basic prices per person employed. 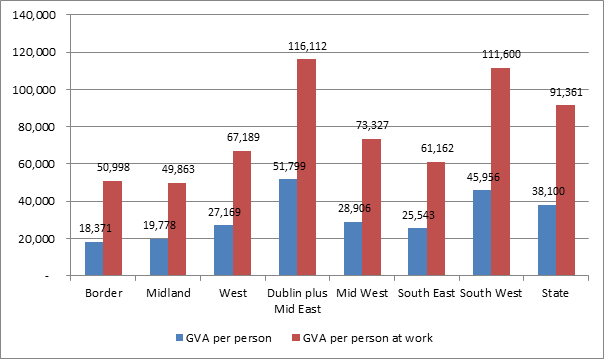 It should be remembered that in the regional GVA data for Ireland the ‘person at work’ statistic is related to the region of residence rather than of employment and so the gaps in GVA among regions can appear even wider. This is shown in Figure 9. GVA per person at work is, as expected, highest in Dublin at €116,112 per person at work while in the Midland region it is €49,863. High levels of labour productivity are linked to the efficient use of labour (without using more inputs) and to the mix of activities in the regional economy (some activities, such as financial services, have higher levels of labour productivity than others). The South West also shows a very high level of labour productivity. At €111,600 per person at work the South West is only slightly below that of Dublin and the Mid East. This is also likely to be due to the sectors in the region, especially pharmaceutical and other multinational manufacturers. Where a region has a higher proportion of older people, children, or people not in work for other reasons, the GVA produced is being divided among relatively fewer people at work and so the figures for GVA per person at work appear better. This is the case in the Border region most significantly, where only 36% of the population is classified as being at work, but also applies to those for the Midland region (39.7%) and the Mid West (39.4%) all of which have a lower proportion of people at work than the state average (41.7%). In contrast Dublin (45.2%) and the Mid East (43.2%) have much higher proportions of people at work in their populations. 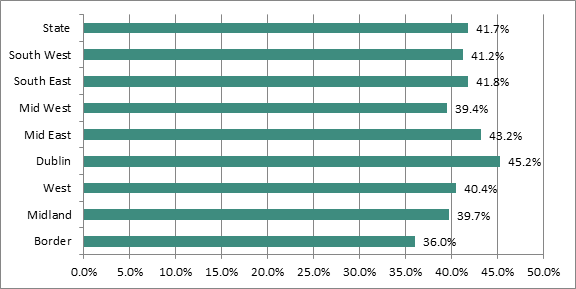 Figure 10 below shows the proportion of the population at work in each of the regions in 2014 as estimated by the CSO. Dublin and the Mid East had the highest GVA per person in 2014 (€51,799), while the South West also had high output (€45,956). In contrast the Border (€18,371) and Midland (€19,778) were much lower, the Border region only 35% of that in Dublin and the Mid East and the Midlands 38%. The Border is the only region to still have a lower GVA per person in 2014 than it did in 2010. 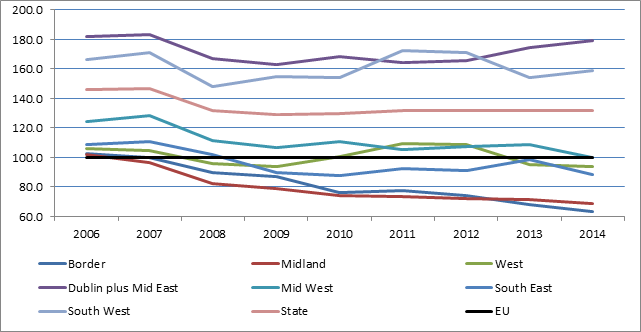 All other regions are now above the 2010 level, (though only by small amounts in the Midland and West). However, only Dublin plus Mid East and the South West had higher GVA per person in 2014 than in 2006 and other regions have not yet returned to the 2006 level. The differences in GVA growth among regions are partially the result of increased productivity and concentration in high value sectors in the wealthier regions, and partly relate to different commuting patterns and the worker to population ratios. The variations underline the importance of ensuring that there is a focus on regional development needs and a policy of investment and promotion of higher value sectors in all regions, so that the benefits of the recovery are felt more widely. The allocation of cohesion funds is currently based on a decision referring to average GDP per capita during the three-year period from 2007 to 2009; a mid-term review of cohesion policy allocations is taking place during the course of 2016 and will likely result in some changes to the system — more information is provided in an article on regional policies and Europe 2020. See here also . 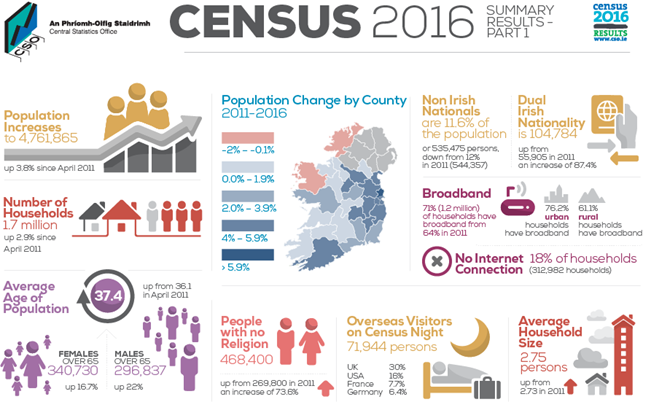 The CSO recently released their Business Demography data for 2014 which, combined with the Preliminary Results of Census 2016, shows the continuation of clear economic as well as demographic spatial patterns. The Business Demography data measures active enterprises in the business economy and provides data at county level. An enterprise is assigned to the county where it is registered with the Revenue, so for a business that has multiple locations (e.g. chain stores, banks, multinationals) the business is only counted in the county where it is registered (often Dublin). This makes the data somewhat limited, however it does give a true reflection of enterprises that are registered and operating in a county. 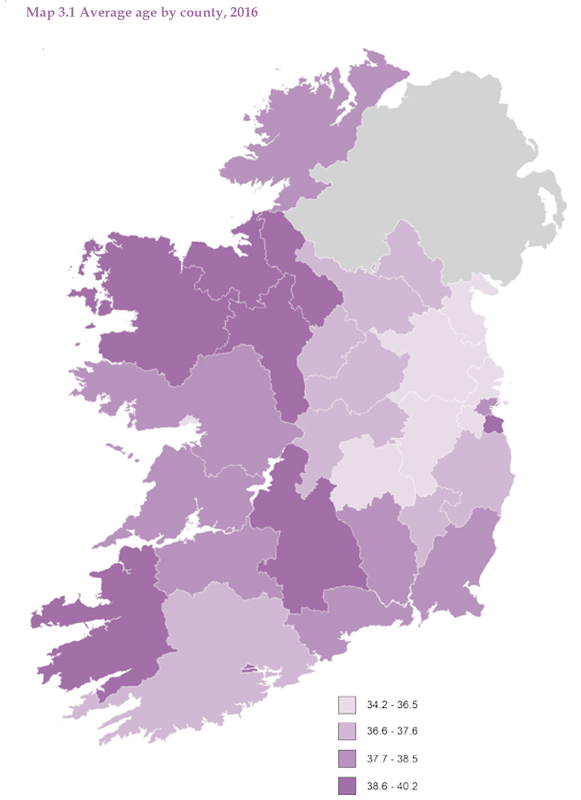 In 2014 there were 40,797 active enterprises registered in the seven county Western Region. This was 8.6% below the 44,621 in 2008. In contrast, in the rest of the state (all counties other than the seven counties of the Western Region) the number in 2014 was just 1% below the 2008 figure. And there were even greater differences when we consider sectors. Fig. 1 shows that with the sole exception of Real Estate, the Western Region had a weaker performance – greater decline or lower growth – than the rest of the state in every sector between 2008 and 2014. Unsurprisingly Construction experienced the greatest decline in the number of enterprises, while the locally traded services sectors of Transportation & Storage, Wholesale & Retail also declined in both the region and rest of the state. For three sectors (Financial & Insurance, Accommodation & Food Service, and Industry) there was a fall in the region, but growth elsewhere. The Financial & Insurance sector shows a very stark difference, while there was also a substantial difference for Industry. In the sectors where the Western Region experienced growth, we can see there was a considerable gap with the rest of the state the knowledge services sectors of Information & Communications and Professional services. The difference in the experience over the period contributed to the current enterprise profile of the the Western Region and rest of the state. Fig. 2 shows that, similar to employment patterns, the traditional sectors (Construction and Industry) and local services (Wholesale & Retail and Accommodation & Food Service) account for larger shares of all enterprises in the region, with a lower share of enterprises in knowledge services sectors. From Fig. 3 it is clear that there were massive differences in the experience of counties over the period, ranging from a 14.2% decline in the number of enterprises in Monaghan to a 7.1% increase in Dublin, the only county with more registered enterprises in 2014 than in 2008. This is of course influenced by the practice of registering business headquarters in Dublin even if they have locations in other counties. Evan allowing for this, there is a clear spatial pattern with Border and Midland counties experiencing particularly large declines. 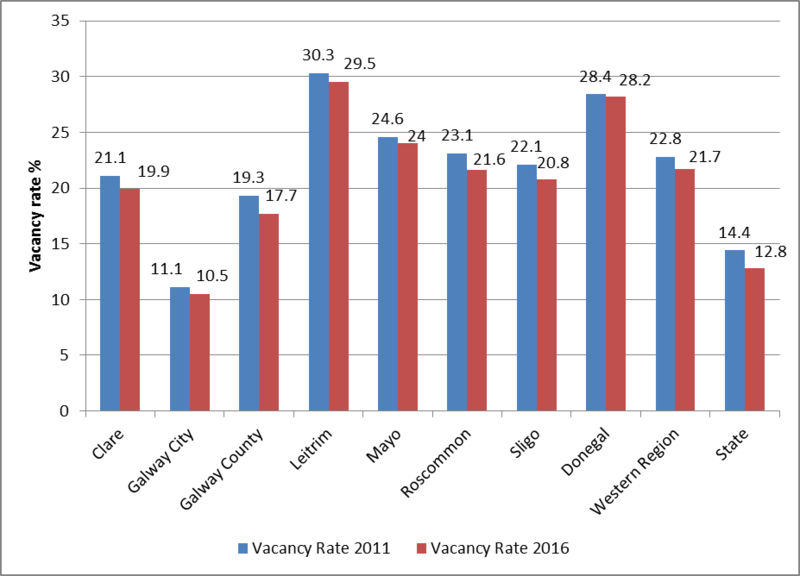 Among the western counties, two of the large rural counties (Donegal and Mayo) experienced the greatest declines in enterprise numbers. 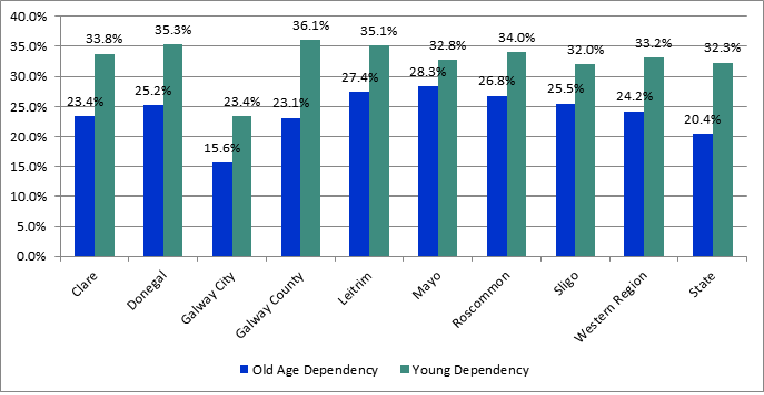 Roscommon, Clare, Galway and Leitrim meanwhile had quite similar experiences, declining by around 7%. Sligo performed best with a fall of just over 4% in its number of enterprises. The enterprise profile of each county and the performance of enterprises in different sectors is a key explanation for these county differences and we’ll examine county patterns in more detail in a future post. In addition to the data on enterprise numbers, the Business Demography data also provides information on employment in these enterprises, which we’ll also examine in more detail in future. But this initial overview of the data clearly shows a significant decline in the number of enterprises based in the Western Region which is reflected in a weaker performance across all sectors of the business economy. It does not include Agriculture, Health, Public Administration or Other Services. While it does include data on Education, that sector is not counted in the total figures as many of the enterprises in the sector are publicly owned.